This has been a BUSY week in Quadland so it’s our first post since last Thursday! I’ve been working on another post, but I’m yet to finish that one. We’re linking up with Rebecca at A Beautiful Ruckus for The Little Things Thursdays again. If you have spare time, don’t forget to check out what little things were happening around the blogosphere this week. 1. One staple of our babies’ wardrobes is Baby Legs. They are FANTASTIC! Every time we make a trip to the doctor, the babies don Onsies with coordinating Baby Legs. When they need shots, we just pull the Baby Legs down a bit without having to finagle miniature pants and socks. After the shots are done, we load them up and leave. I’ve also figured out that Baby Legs work as lightweight jackets when we stroll around the neighborhood in our Runabout! 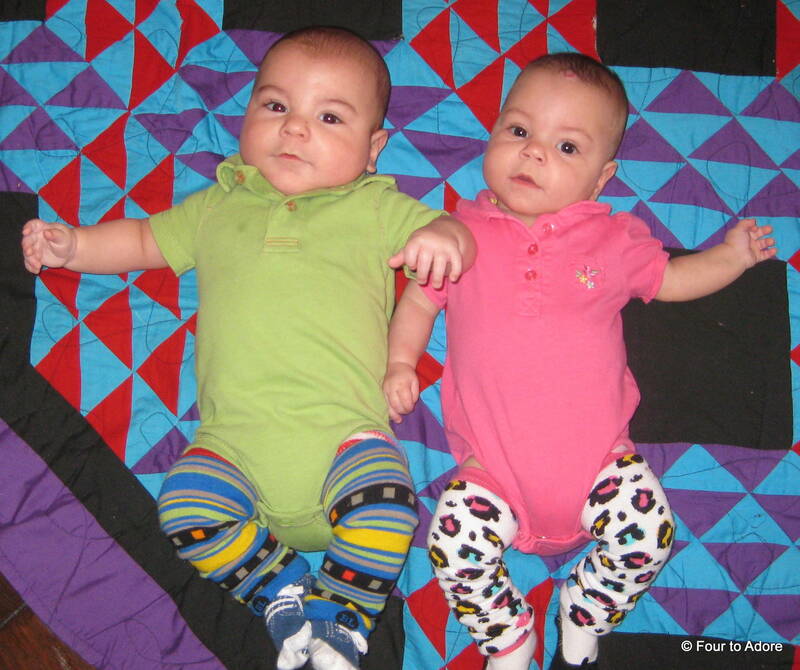 Harper and Sydney are modeling their Baby Legs here. 2. Now that the babies are eating real food, we have to prepare said food. We’ve been experimenting with existing kitchen equipment including a Baby Bullet gifted to us, our old Magic Bullet, rice cooker, blender, and food processor. These gadgets got the job accomplished, but very inefficiently. For example, the Baby Bullet took 13 minutes to steam a single pear where we had a five pound bag to puree! 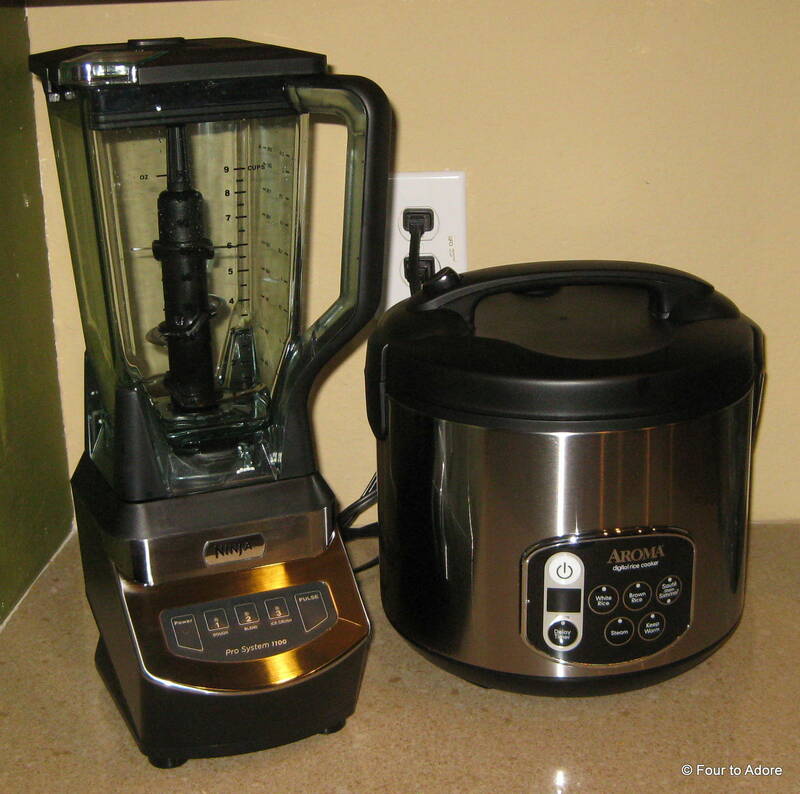 After some research we added two new appliances to our arsenal: The Ninja 1100 and 20 cup Aroma rice cooker/ steamer. Both appliances are multi-purpose and we hope will grow with our family. We gave them a test run last night and were able to process the pears in about 25 minutes, including cook time. 3. Sunday afternoon, I left George in charge of the babies and headed to Costco. I picked up organic produce for baby food as well as a few other essentials. Today the babies gave butternut squash a try and LOVED it! I think we have a new family favorite along with bananas. Rylin took thirds of this yummy concoction! 4. 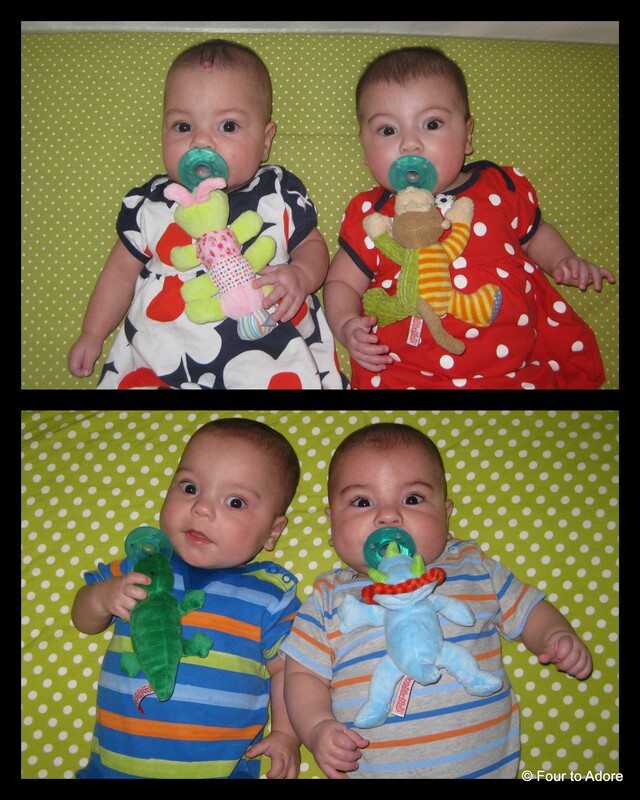 When the babies were in the NICU, the occupational therapist there introduced us to Wubbanub pacifiers. Since then, each baby has used the same Wubbanub. 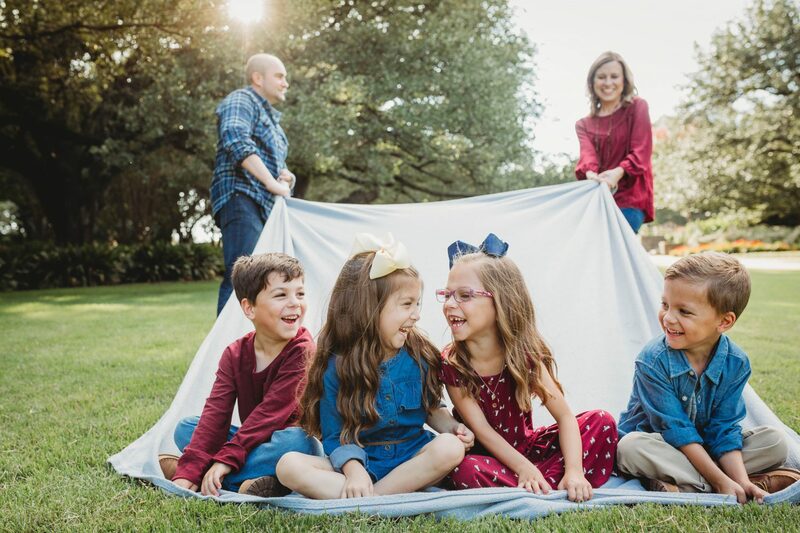 Recently, they have become sort of “security blankets” as the babies enjoy holding them and rubbing them on their faces or gnawing on the limbs. One day I washed them and left them out to air dry. This did not bode well with Mason who refused his nap until given a damp Wubbanub. Thus, I ordered a second set for backups! 5. As the babies began expressing interest in holding their bottles, I thought it might be time to try trainer cups. I ordered a variety of different ones to experiment with and also pulled out some the babies received for Christmas. I’ve been putting about an ounce of water in them and letting the babies try to pick them up. Mason was the only one who seemed interested in the sippy cups today. 6. The weather here has been absolutely lovely. Despite being February we had highs in the 70’s this week. We’ve logged more time in the Runabout with this weather. We use the sun shade, but the babies heads and faces are usually exposed to the harsh sunlight. They have plenty of winter hats, but no sun hats. So, I ordered some from The Children’s Place. 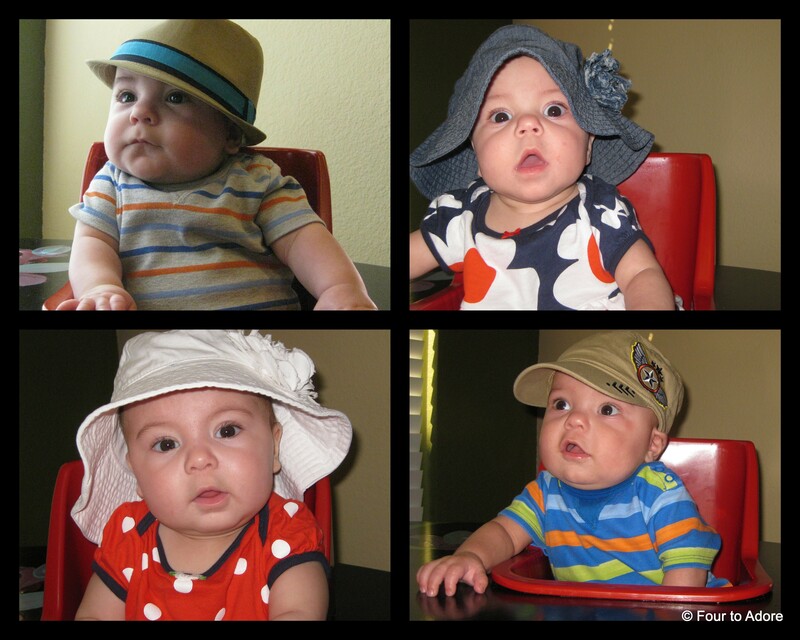 George chose a fedora for Harper and military hat for Mason while the girls got floppy sun hats. They each modeled their hats today. Sydney was a bit perplexed at the size of hers. Apparently she will be able to wear it all summer long! What little things happened in your week? Is there anything new at your house? We were given Wubbanubs by a NICU nurse too! Those ladies know their stuff! I wish I had known about the baby legs! That looks like a brilliant idea! Also, your kids are adorable. Seriously. And that expression on Sydney’s face in the last set of photos is a riot! Wubbanubs are the BEST! Too bad you didn’t have Baby Legs, I love them. So happy to link up again, I just think it’s the greatest idea. The hats are too cute!!! I actually almost put Mason’s in his box a few months ago too. He really never used it even when he was tiny. 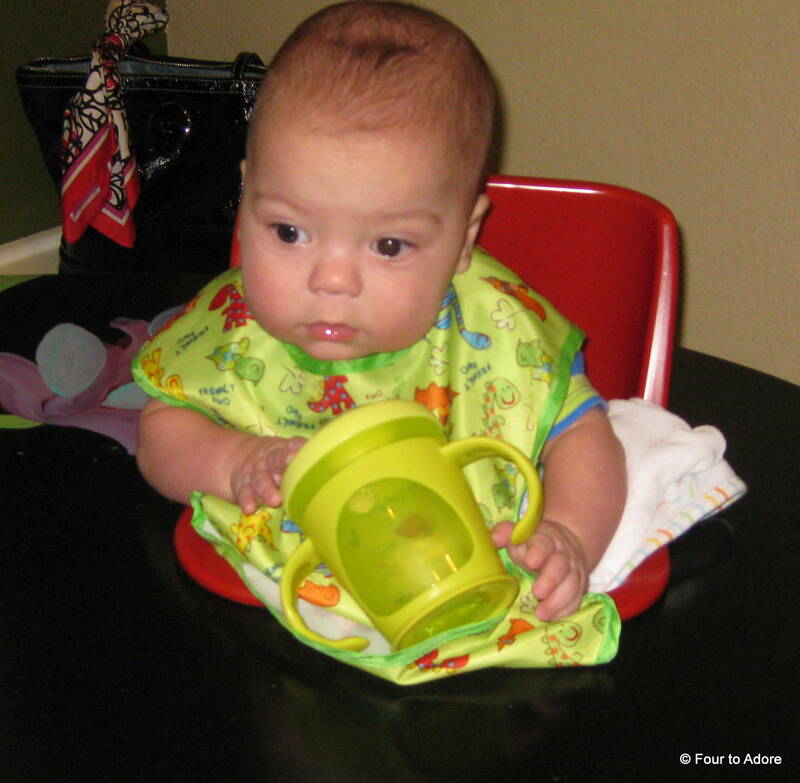 Then, a few weeks ago he started using his hands really well and put it in his own mouth! If he’s visiting another baby’s crib he often grabs theirs! They really like them more now than ever before. Maybe get them back out. Amen to online shopping! And twice-yearly trips to the JBF sale so I can get half a year’s clothes shopping done at once! Oh yes, LOVE JBF! In fact, we have one coming up in March. Zeva just got her leggings in the mail the other day, and she seems to enjoy them because she has been handing them to us to put on her ever since she got them. So happy you got baby legs and a wubbanub too! I was surprised how big the new animals were, our original ones are much smaller. I know you get this all the time, but I am just loving all your posts and seeing those precious babies doing so well! 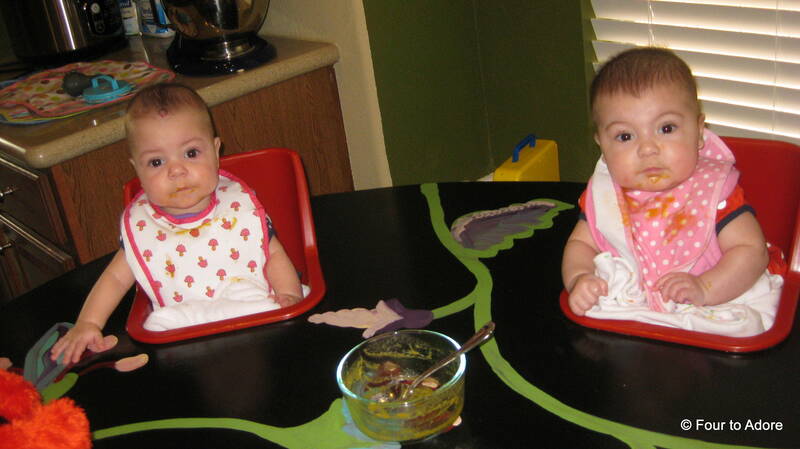 This may be a bit too much to ask, but is there a cookbook or website you’re using for the baby food recipes? I am making Noah’s baby food and am looking to add a few more items to his menu. I loveeeeeee hearing from anyone who reads, especially people I know outside the blog. I have a few cookbooks, one is called Le Petit Appetite. But, honestly we are just pureeing produce with the liquid from steaming or a bit of juice to sweeten. We aren’t too fancy yet. The pedi said we could purée our meals when they have tried all the ingredients previously! Lol, I agree we could switch up names so easily. I always love how we normalize for each other! Oh…those…hats! They have so much personality. Love it. Blessings and Love to all of you!!! Wow! Where to start?! lol … I love the “leggings”! Ive seen a pattern where you take adult knee high socks and make baby/toddler “leggings”! Thank you so much for reading, and taking the time to comment! I always love getting feedback, and encouragement from readers! Happy New Year!